Coastal cities, municipalities, and towns are, literally, where people and water come together. Recently, the mayors and city leaders of local communities throughout the region - in both Canada and the United States - have strengthened their ties and their muscle to keep the "local agenda" at the forefront of the national discussions. Jill Wingfield of the Great Lakes Fishery Commission staff had a chance to talk about the value of the waterfront to local communities with David Ullrich, Director of the Great Lakes and Saint Lawrence Cities Initiative and Commissioner of the Great Lakes Fishery Commission. Jill Wingfield: What is the Great Lakes and Saint Lawrence Cities Initiative (GLSLCI) and why was it established? What are some of its priorities? David Ullrich: The GLSLCI is a bi-national coalition made up of 76 cities and other local governments (represented by mayors and other local officials) that represents more than 13 million people in the Great Lakes St. Lawrence River regions. It was established in 2003 to: give cities a voice at decision making tables; establish decision making principles; and, raise awareness of the importance of the water to the cities in these regions to policy-makers in Washington, DC and Ottawa, Ontario. While the initial focus of the GLSLCI was on water quality, quantity and waterfront vitality, its agenda has since expanded to address a full suite of environmental issues such as water preservation, pharmaceutical disposal, and storm water management. Recently, the Green CiTTS (Cities Transforming Towards Sustainability) Program was established to support member cities' efforts to develop innovative conservation practices and an integrated approach to sustainability. Wingfield: In what ways do cities benefit from their proximity to the Great Lakes and St. Lawrence River? Ullrich: Historically, cities were built near the water because they were a source of food and drinking water, provided a means of transportation, and allowed for easy waste disposal. All of these features hold true today. Added to the unquantifiable benefits of recreation and aesthetic beauty, these qualities make the Great Lakes and St. Lawrence River regions very desirable places to live. Over the years, use of the lakes has evolved to include recreational activities. 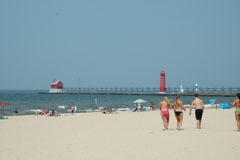 Beaches are hugely important to cities now. Also, shoreline property has more value. One anecdote: A condo building constructed in Chicago had two identical units on the same floor; the one with a view of Lake Michigan was priced 20% higher than the one with a view of the city. The waterfront is a critical component of the economic foundation of shoreline municipalities and, as such, it is a central element to their identity. Not surprisingly, virtually every coastal city promotes waterfront access, views, property, and activities as key features. Wingfield: In what ways do coastal municipalities use their proximity to the lakes as a "selling point"? Specifically, what does the fishery mean to local communities? Ullrich: Virtually every member city "pitches" the water and the access to the water as a central element of their city. Generally speaking, smaller communities tend to focus primarily on tourist opportunities such as charter boat fishing, sailing and swimming at the beach, whereas larger communities not only emphasize tourism but also strive to attract permanent or seasonal residents. 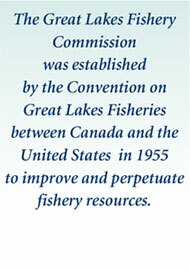 Commercial, recreational, charter, and tribal fisheries exist throughout the region. The recreational and charter fisheries are a significant source of revenue for smaller communities in particular; charter captains, marinas, equipment retailers, hotels, and restaurants all benefit from the fishery tourism traffic. For example, in 2009, the salmon fishery on Lake Michigan alone brought in more than $32 million in revenue for coastal communities. Wingfield: You work with a wide variety of Great Lakes mayors in Canada and the United States. 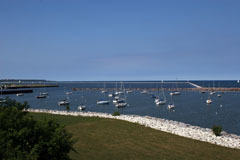 Do you have any noteworthy examples of how a particular mayor has used the Great Lakes to promote his or her city? Do you see any cities that ignore their potential? How so? Ullrich: Cities that have elected to join the GLSLCI recognize the value of the Great Lakes and St. Lawrence River and want to do more to capitalize on their proximity to these resources. While there are cities that undoubtedly ignore their potential, I am fortunate enough to get to work with cities and elected officials that understand the importance and infinite value of the lakes and river. For example, most of the city logos in the region include either a maritime or nautical image; clearly the waterfront is a central element of these cities. Specifically, Georgian Bay communities such as Town of the Blue Mountains, Collingwood, The Archipelago, and Parry Sound do an exceptional job at marketing the lakefront as a major tourist attraction. The fishery is touted as a main attraction by a number of cities including Port Colburn, Ontario; Marquette, Michigan; and, Sheffield Lake, Ohio. Wingfield: We hear a lot about "livable communities," which seems to be the goal of planners who want to transform urban living. What is the vision for the quintessential "livable" Great Lakes city? Ullrich: This is an increasingly important and popular issue. The basic characteristics that make a city desirable-a strong economy, clean environment, and equitable social structure-have not changed. More recently, however, there is a growing trend promoting "green living" which requires cities to undertake a progressive approach to city management. Setting the course for a sustainable future through the adoption of "green" practices such as the development and implementation of clean technology is the primary objective of the Green CiTTS Program. Goals of the programs include: prevention of water pollution, promotion and use of renewable energy resources, adoption of green land use and building design, and encouragement of green economic development. A local architecture firm [Skidmore, Owings and Merrill LLP City Design Practice] is examining the notion of defining a "livable" Great Lakes city with a project aimed at developing a 100-year plan for the Great Lakes region to address issues concerning sprawling development, congestion, urban and agricultural runoff, power generation, and invasive species, among others. Wingfield: Are lakefront communities any more or less resilient than inland communities to changes in the national economy? Ullrich: If anything, coastal communities are less vulnerable because in the long term, the availability and access to water is going to be of increasing importance to cities. The Great Lakes and St. Lawrence River provide a strong degree of economic security for coastal communities as well as an immeasurably improved quality of life for its residents. Broadly speaking, lakefront communities are more resilient in the long term because of their proximity to such an invaluable resource. 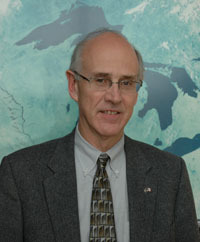 David Ullrich, Director of the Great Lakes and St. Lawrence Cities Initiative and Commissioner of the Great Lakes Fishery Commission. 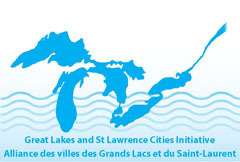 Many cities on the shores of the Great Lakes and St. Lawrence River prominently feature their status as a waterfront community in their city logos.